I'm starting to panic a little about not being ready for Baby Monkey. I'm in my 30th week (YEY!) and I started thinking yesterday that I could have baby in 2-2 1/2 months. Yikes! I printed out the Consumer Reports Baby Needs Checklist and realize I only have 3 things on that list-crib, stroller and car seat. All very important things indeed, but still, SO much to get. And what really makes me worry is that David and I can never decide on anything. But in this case we just have to as time is running out. So I started registering for all kinds of stuff at Target and Buy Buy Baby. More so for me to remember to get than for others. I'm so afraid of not being prepared and having to send out David everyday to pick up yet another item we forgot to get. I guess this is normal. Luckily though we do have a baby store right across the street from us which I'm sure will be a lifesaver. What luck! I've also been struggling with the whole diapering decision. 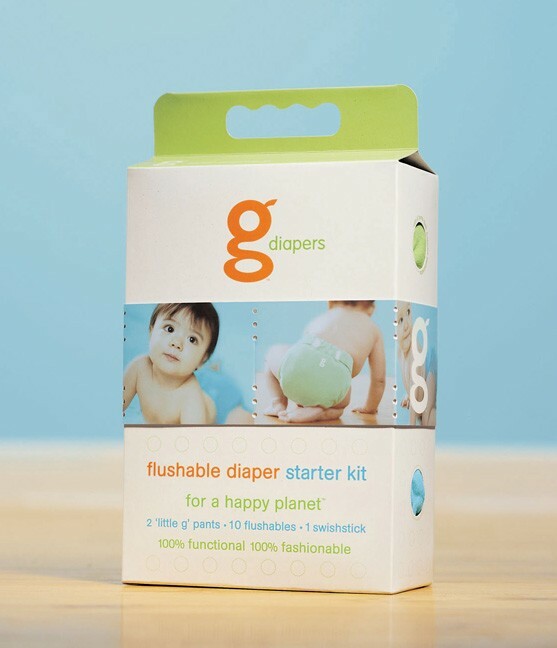 I just can't feel good about using disposables for the diapering career of my child. I think I read it takes 500 YEARS for disposable diapers to disintegrate into the earth. And they are just so full of chemicals. Not to mention the diaper rash they cause as they don't allow baby's skin to breathe. But I've decided to use disposable (yuck) in the very beginning as everyone I know has recommended Pampers Swaddlers for newborns. I just feel that we will be so tired and overwhelmed, having to wash and think about an alternative diapering solution won't be feasible in the early weeks. But as baby gets a little older I definitely want to try other options. But cloth seems difficult for apartment living as I can't and won't wash crappy diapers in a neighborhood laundromat. So I started thinking that maybe buying a portable washing machine and doing it here at home is an option. 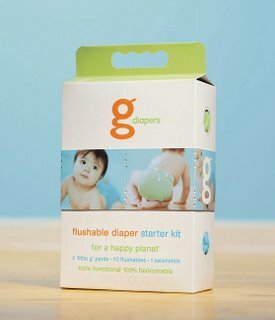 Another option I hope to try is these-Gdiapers. They basically have three parts, the cloth underpant (washable), the plastic liner (washable) and then the flushable insert. Flushable-what a invention! No poopy diaper smell in the apartment, no chemicals next to babies skin and no damage to the environment. I've heard mixed reviews, but am willing to give it a try. And they are just so damn cute too! I sure hope they work for us. Too bad they don't have a BabyDirect that you can log onto to have all your baby needs delivered right to you. Can't you just make diapers out of xerox paper and Saran wrap? That's what my Mom did. And my rash is almost all healed. But that paper cut, ow. Then what? Put it in the shredder? Eww. That's strange. Why did I come up as Anonymous. Who the Hell is that? Why are they called gDiapers? I think iDiapers will be much cooler. Maybe Ben can get you the U2 special edition Red iDiapers.